Juliet Marillier has a way of creating a world and a culture within her books that are so vivid, descriptive, and that feels so alive, like this particular place SHOULD exist SOMEWHERE in real life. Her writing style is magical, her characters are colorful--and for a mish-mash retelling of The Twelve Dancing Princesses and The Frog Prince, she puts a very excellent spin to the fairy tales. On top of that, there's a great interlacing of vampiric lore. For me, Wildwood Dancing is a conflicting book to rate. On the one hand, the writing is excellent, the world is wonderful, the characters are proportionately good as well as flawed, and the lore of the world is intriguing. On the other hand, the story itself was a little confusing, and the kids in this book were kind of frustrating in their theatrical angst and dramatic woes--when they were happy and having a good time, it was fun to follow, but when they were having their own emo-fests, it got a little irksome. Nonetheless, I still enjoyed this book a lot, flipping through pages with a hungry need to devour each word. The story of Wildwood Dancing takes place in Transylvania; the imagery presented of the Dancing Glade, the woods, the castle of Piscul Dracului is atmospheric. Jenica and her four sisters (Tatiana, Paula, Iulia, and Stela) cross through a portal into the Other Kingdom every Full Moon to join in the festivities of the fey creatures where they converse with the beings of the Other Kingdom and dance all night. This is an activity they look forward to each and every month. Back in their own world, however, the girls are now faced with a sickly father who must leave to recuperate his health in another city, far away. He puts Jena and Tati in charge of the household, responsible for business, finance, and taking care of their younger sisters. But as the days progress, their situation becomes more and more complicated and Jena finds that being the sensible one, the sister with all the answers, is much more of a struggle than she had expected. Her cousin Cezar has swept into their household; under the guise of "looking after" the girls, he has thrown a possessive, tyrannical hand into controlling the home and lands of Piscul Dracului. Jena is losing control of her own household, too afraid of and too respectful of his position as a male cousin, to fight back and regain her own household. Tatiana has fallen in love with a mysterious boy from the Other Kingdom who may be one of the Night People. With the dangers connected to talk and lore of the Night People, Jena is frightened for Tati's life should this mysterious boy choose to hurt her. But Tati has taken to moping around and daydreaming, and pretty much wasting away in the name of love. With only her best friend, a frog named Gogu whose sentient thoughts only she can hear, supporting her each day, Jena must overcome these complications and she must figure out what to do to protect her sisters as well as regain control over Piscul Dracului, all while struggling without news of her father's health. Finally, we also learn early on that Cezar has a dark, vengeful mindset against the creatures and beings of the Other Kingdom. Many years ago, his elder brother Costin was drowned to death in the Deadwash in the woods and Cezar claims that it was the witch of those woods, Drăguţa, who dragged him under. Ever since then, Cezar has vowed to eliminate all the faerie folk in existence, even if it means leveling out the entirety of the woods. There is actually a whole lot more that happens throughout Wildwood Dancing, but if I were to summarize everything, it might get a bit long-winded. The main conflict is fairly straight forward, though, with Tati's growing relationship with Sorrow and Cezar's tightening control on the girls and their household being the major issues Jena must deal with. As I've stated, the world is created brilliantly with all forms of characters who matter, whether they are side characters, cameo characters, or the main characters; and an extensive culture of people and places that can be further expanded upon if the author so chooses to continue writing stories in this world. I absolutely adored Jena and her relationship with Gogu; they had a sweet development and a love based on trust and understanding. And I loved the interaction between the sisters. What I found a little frustrating, however, was that I wasn't sure if I was angered by the characters' irrational acts because Ms. Marillier created them so life-like, or if I was just irritated by the situations being thrown at Jena because Ms. Marillier created such emotionally-charged, personal conflicts. Or was it really just certain scenes and certain characters who irked me? Jena was strong and despite the fact that she had little success standing up for herself, it was really the thought that mattered in this particular book. With so many things going against her--Cezar's bullying control, Tati's irrational behavior upon falling in love, her younger sisters being unable to share the burden, and everyone, in general, looking to Cezar for leadership because he's a man--it's wonderfully admirable that she tried to stand-up for herself and her household time and time again. Because despite the fact that Jena has been taught by her father to learn the business and manage the finances properly, her position as a girl (and a young girl, at that) has made it hard for anyone to see her as a leader in the household, save for her immediate household. No matter how much more logical Jena's train of thought was compared to Cezar's chauvinist ideas, Cezar's looming dominance always warned against her continued defiance of him. No matter how often she disagreed with Cezar's actions and ideas, he would merely blow her off like she was an ignorant child, never taking her seriously and never truly listening to anything she said. I was constantly frustrated on her account. I was frustrated that she allowed Cezar to continue bullying her in her own home; but then I was frustrated because I knew that she had little success of fighting against Cezar--physically or publicly--and winning without someone bearing some scars. She feared him because he was bigger and stronger physically, and she also didn't want to anger him because he was family; however, because she didn't agree with all of his ideas, she tried her best to tactfully put him in his place and explain to him his ignorance. Not that it really worked--Cezar is one stubborn douche-nozzle. I continued to be frustrated when Cezar kept finding more reasons to exert his dominance over the girls with his own twisted logic of narrow-minded explanations. My frustration only grew with each instance of his continued prejudiced mindset. I continued to be even more frustrated each time Jena's arguments against her cousin were simply met with his further belittling and ignorance. I was also frustrated when Tati, the eldest sister, began shirking all of her duties and her responsibility for her sisters just because she had fallen in love with a man who lived in the Other Kingdom and could only see him once a month. The way she could only think about her love with claims of "You just don't understand true love like what I'm going through!" further grated on my nerves. And despite all the warnings of keeping their visits with the Other Kingdom a secret lest anyone be put in danger, Tati's actions simply do the exact opposite: running off to wander the woods every night hoping to see Sorrow, rushing off to the Other Kingdom during Dark of the Moon to find Sorrow, meeting with Sorrow in plain sight despite the danger. Generally, her putting her own need to see and be with Sorrow above everything else really kind of doubled all my frustration. And I don't want to spoil the end of the book; but simply put, the last few chapters after the main conflict was resolved went by in a dragging fashion. It has to do with Tati and what she did that made me truly believe that she is a one-tracked, narrow-minded, very selfish individual who doesn't understand how to listen to others or how to think about life outside of her own desires. There really is a distinct difference between the sensible Jenica and too-sensitive Tatiana. Both had fairly grand romances happen to them within the scope of the story--Tati's love is one of forbidden romance where she and Sorrow both fall hard, fast, and eternal, while Jena's love is one built of friendship and trust, and many, many years of progressive development. But while Tati mopes around and wastes away in the name of love, Jena continues to strive to take care of her family, bearing all the burden on her shoulders as each day goes by. Wildwood Dancing is an extremely well-written young adult book with romance, adventure, a magical fairy tale atmosphere, and characters that make you feel proud, but also characters that drive you batty. While the romances are a pretty large plot line in the book, they are surprisingly subtle. Jena's conflict with Cezar and with Tati and then with the Night People are the main priorities. The conflicts and their resolutions, however, are fairly predictable at the outset. Getting to that conclusion, however, was an interesting journey. 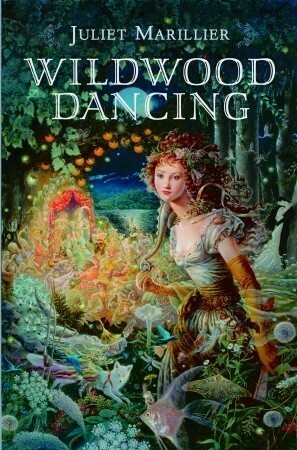 Unfortunately, the story of Wildwood Dancing itself DOES feel a little directionless and for the first half of a book, I wasn't quite sure where we were going with the progression. Then we settle on two specific conflicts and all seems to tie together quite well.